Councilor Dennis Tim Salazar was born and raised in the beautiful Española Valley and is a member of the Salazar and Alarid families who have lived in the beautiful Espanola Valley and have been involved in community service for many years. Councilor Salazar is married to Bernadette Rael-Salazar and they have two sons, Tim IV and Joshua. Councilor Salazar is the son of Bennie Alarid Salazar and the late Eutimio "Tim" Salazar III. 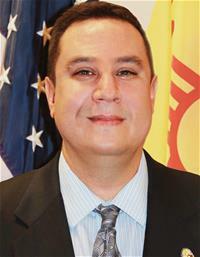 Councilor Salazar is a 1992 Graduate of Española Valley High School and went to Northern New Mexico College with a focus on Political Science and Criminal Justice. Councilor Salazar was first elected to the Española City Council in 2004 and is currently serving his 4th consecutive term in office, serving Espanola City Council District-1. Councilor Salazar is very grateful to the constituents of District-1 and is greatly humbled for the trust shown while being the District-1 Representative. Councilor Salazar has served on many committees since being a member of the Council. He has been Chairman of the Public Safety Committee and Community Services Committee in the past and has been a member of the Public Works Committee, Finance Committee, Finance Board, New Mexico Drug Implementation Board and E-911 Board. Councilor Salazar currently serves as the Chairman of the Finance Committee, he also serves as a member of the Community Services Committee. Councilor Salazar was first appointed in 2012 to serve on the North Central Regional Transit District (NCRTD) Board of Directors and was elected by the NCRTD Board of Directors to serve as the Board Secretary/Treasurer from 2014 to 2018. In April of 2018 Councilor Salazar was elected by the NCRTD Board of Directors to serve as their Vice-Chairman.